I mentioned in yesterday's post that I went to DC because one of my good friends invited me to an event. He was invited to join the Knights of Malta, and asked me to be his date for their Annual Dinner/gala that they held in the evening after the formal investiture (initiation) ceremony in the morning. Since I love DC, I was more than happy to join him and have an excuse to make the trip! The investiture day was a fun, but long, day. It began with the actual investiture Mass itself, celebrated by Cardinal Wuerl, who actually used to be a bishop here in Pittsburgh!. Mass was followed by a luncheon, and then they gave us a few hours to get ready for the dinner in the evening! I, of course, had made an appointment at Drybar to get my hair blown out, so I hurried there, and only had about an hour or so by the time I got back to my hotel after my blow out, so I had to get ready pretty quickly. Of course, picking out my dress for the dinner was very important. I ended up going with this Adriana Papell dress - I love anything beaded and sparkly! They also make a cocktail length version, and it comes in lots of other colors, too. The dinner was so much fun - it was a really amazing night. It was held at the US Chambers of Commerce, which was an absolutely beautiful building. I didn't want to take any pictures during dinner, but I wish I had - the ceiling was wooden beams that were intricately carved with state names, and mottos, and emblems. Every single part of the evening was fantastic - from dinner, to dancing, to all of the people I met, who were so kind! 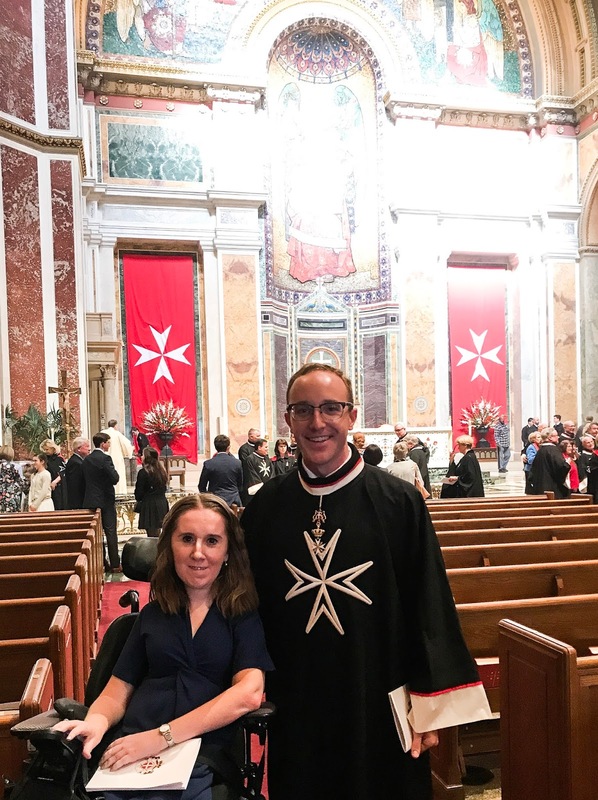 I'm really excited for and proud of my friend being invited to join the Order of Malta, and truly honored to have been asked to join him on such a wonderful day!